A truly smart robot adapts to a variety of challenges on the fly—like adjusting its posture to push or pull big objects, just like a person does. But what comes naturally to humans is a lot more complicated for robots. Take this ‘bot developed by the University of Tokyo’s JSK Laboratory, for example. The clever humanoid will try to move a heavy load with its arms. If it senses the object isn’t moving, it wises up and tries an entirely new position autonomously. It might turn around, lean against the object, and try walking backwards against it, just like you might. It sounds simple, but this is really cool behavior, as IEEE Spectrum explains today. This kind of improvisational problem-solving is an extremely human trait. Lots of robots, especially ones currently being used in factories and whatnot, are only programmed to do one task, in one way, in one place. For example, a robot that stays in the same location on the work floor and lifts heavy boxes coming down a pre-designated conveyor belt. 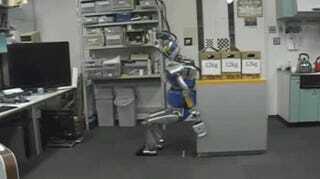 Even more impressive is that the robot doesn’t stumble or fall—like I might. It can adjust the size of its steps based on how much, or little, the object is moving. This is also a big deal, because it not only shows the robot replacing what could literally be back-breaking labor for a human, but that it could also perform the task better than a human. According to Spectrum, the ‘bot was presented by University of Tokyo researchers in a paper called “Whole-Body Pushing Manipulation With Contact Posture Planning of Large and Heavy Object for Humanoid Robot,” at IEEE’s International Conference on Robotics and Automation in Seattle last week. Check out the full video below. And don’t take pushing for granted—it’s hard for our robotic friends.